Below are some of our frequently asked questions regarding our albums, but don’t hesitate to ask your own! We can’t wait to share this beautiful keepsake with you! What’s included with my Wedding Collection? 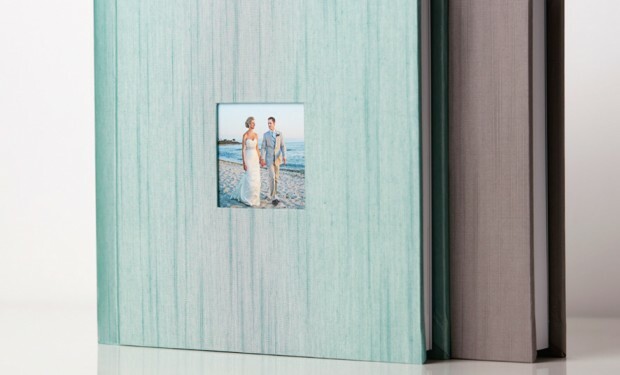 Your Wedding Collection includes a 10×10 Album with 30 pages. You can choose between two cover choices: Japanese fine-art fabric or genuine Italian leather. *Note: If you choose Natural Linen, Pure Linen or Luxe Leather, there is an additional charge of $30 per album. Which cover fabric should I choose?! We personally LOVE the modern sophistication of the Japanese fabric albums! However, leather albums have a classic look that always stands the test of time. Both styles are hand-crafted with the finest materials and guaranteed for life from any manufacturing defects. So, you can feel confident simply choosing whichever style fits you two the best! Absolutely! You can have up to 80 pages in your album. However, anything above 60 pages will result in a slightly thinner page thickness. This is done in an effort to not compromise the quality of your album binding. Additional pages are $20 each. What if I want to add Debossing or a Cameo cut-out to my album? You can add debossing to any album for $20. This includes up to 2 lines of text. Debossing works better on the leather albums than it does on the fabric albums, therefore we recommend the cameo cut-out for fabric albums. The cameo cut-out can also be added to any album for $20. Do you have parent (mini) albums available? Yes, we have parent albums available, beginning at $375 for a 6×6 album. Our mini albums are exact duplicates of your larger album, using the same high-quality materials!